What surfer looking to catch bigger and better waves hasn't aspired to ride the pristine, crisp blue barrels of Oahu's North Shore? Waimea Bay ... Sunset Beach ... Banzai Pipeline ... Haleiwa - these are surf break destinations that play host to thousands of amateurs, pros and wanna-be pros from around the world each year. 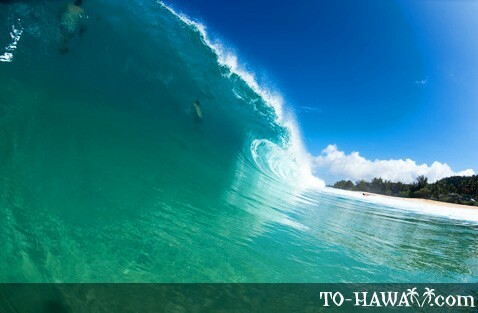 The Vans Triple Crown of Surfing, a popular big wave surfing competition, takes place on Oahu's North Shore each year. 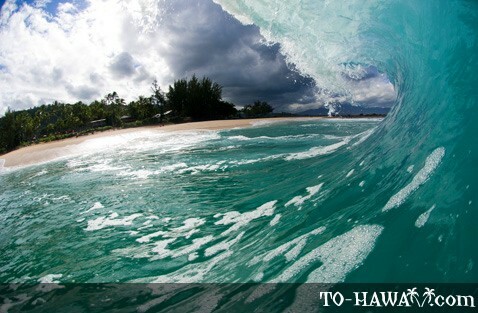 There are also some fantastic surf spots on the other Hawaiian islands. On Kauai, Tunnels Beach on the island's north shore is one of them. And on Maui, it's Jaws, also known as Pe'ahi. 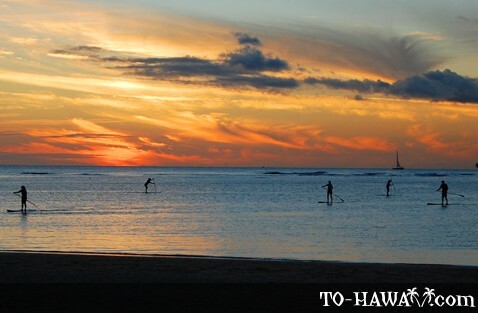 The Hawaiian Islands are a surfing mecca with some of the tallest and cleanest waves in the world. Generally speaking, the surf is higher on all north facing shorelines in the winter months (November to January) and on all south facing shorelines in the summer months (June to August). Sometimes the surf is up higher than usual, as was the case at the end of August 2011 on all south facing shorelines. Wave heights reached 10-15 feet (3.5-5 m). To see some photos that were taken at Magic Island on Oahu's south shore, click here. 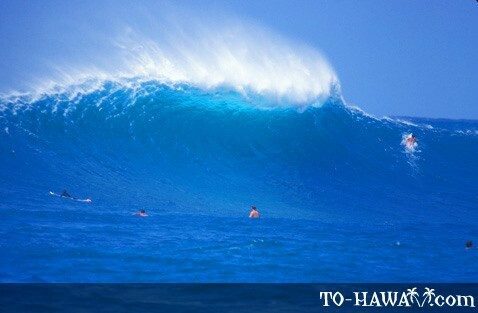 Where else but in Hawaii can you call a local phone number (596-SURF on Oahu) and receive today's current surf report? Oahu's south shore is perfect for beginning surfers - the Waikiki area offers newcomers a chance to rent boards and take lessons in what are usually very non-intimidating surf conditions. Winter (November - April) is the season of big surf on Oahu's rugged North Shore, with wave heights often topping 20 feet (7 m) and counting. Giant swells originating in the northern Pacific Ocean make their way to this coastline delighting big wave riders and drawing crowds that flood local beaches. Be aware - high swells are for experienced big wave riders only! Surfing is one of the world's most dangerous sports, and even the most adept rider can fall victim to the ocean's unpredictable forces. On the majority of days in the summer months (May - October), the once roaring North Shore dies down to a small purr, creating tame, glassy conditions perfect for swimming or snorkeling. Most well-known surf breaks have nicknames that you may not always find on a map. The best thing to do is ask around to find out which breaks may best suit your skill level at a particular time of year. 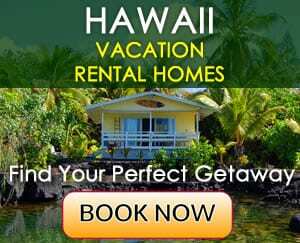 Popular surf spots on Oahu include Velzyland, Backyards, Gas Chambers, Backdoor, Pupukea, Log Cabins, Leftovers, Chun's Reef, Laniakea, Silver Channel, Avalanche, Kaena Point and Walls. Yes, the Hawaiians are the original founders of the "Sport of Kings," referred to as he'e nalu in Hawaiian. After the arrival of England's Captain Cook in the Islands, Lieutenant James King was the first to record accounts of the ancient Hawaiians engaging in this unusual activity. Captain Cook and other non-Hawaiians observing the islands for the first time were impressed by the agility and mastery of Hawaiian watermen. They used very long boards carved from tall trees to hook and ride flowing waves inland while either lying on their bellies or standing upright with one foot in front of the other. The ocean with all of its mystery, life-giving i'a (fish) and kai (water), was very revered and respected as a necessary component of survival for ancient Hawaiians. The ocean was carefully studied, its currents and tides were observed intimately, and fishing, voyaging and surfing were strategically planned. Surfing was not just a form of amusement - it required great skill, stamina, flexibility and balance. A Hawaiian who could master the art of surfing and other ocean skills was well-respected in society. High ranking ali'i (chiefs) were privy to the best surfing spots on each island, and they surfed using only the best boards. Just as there is an art to riding the perfect wave, there is also an art to creating the perfect vehicle to capture that wave. Surfing as a sport gained widespread popularity in the early 1900s, and the art form of surfboard shaping began to blossom. The earliest surfboards were made from the prized koa wood or redwood. They were often 10 feet (3.5 m) long and could weigh in excess of 150 pounds (68 kg). Before modern sanding techniques, granulated coral was used to smooth the wood, bark or charcoal for staining and nut oil for finishing. As the surfboard evolved with the help of technology and our knowledge in physics expanded, surfers could travel further faster, with less effort and enjoy the comfort of lighter boards. Today's boards are lighter and more aerodynamic than ever before. Resin and fiberglass were used for smoothing and finishing, and the addition of polyurethane foam increased the buoyancy of the boards so significantly that many abandoned their balsawood and composite wood tankers for the new wave of more manageable surfboards. The introduction of the shortboard also left a big impression on the surfing world, allowing riders to accomplish so much more on their boards. In the late 1960s and early 1970s, the average length of a surfboard had shrunk from 10 feet (3.5 m) to 6 feet (1.8 m). A whole new breed of surfer was left to experiment with endless possibilities of quick tricks and maneuvers. Longboarding - Riding a surfboard usually 9 feet (2.7 m) or longer. As a general rule, the rider will choose a board that is about 3 feet (0.9 m) taller than him- or herself. Longboards may be less maneuverable than shortboards, but are generally more buoyant, propelled easier and easier to balance upon. Shortboarding - Riding a surfboard generally between 6 and 8 feet (1.8 and 2.4 m) and with a pointed nose and a rounded or squarish tail. The shortboard is considered highly maneuverable, but less buoyant than the longboard. Tow-in surfing - Surfing with the aid of a personal watercraft (jet ski) or helicopter, which tows the surfer out to a particular break and drops him off at the right moment. Used with extremely large waves that may be difficult to paddle into due to size and speed. Bodyboarding - Surfing using a small foam board much shorter and lighter than surfboards, placed under the chest/belly or using a drop-knee stance, usually accompanied by swim fins. Because of the size and flexibility of the small boards, body boarders may incorporate many different maneuvers. Stand-up paddleboarding (SUP) – This sport has become increasingly popular in recent years. No waves are necessary. All one needs is a surfboard and a paddle. More experienced stand-up paddleboarders can choose narrower boards. For novice paddlers a wider and flatter board is best. The paddle should be about 6-8 inches taller than the paddler. Bodysurfing – Riding waves without a surfboard or other flotation device. Bodysurfers usually wear special bodysurfing fins to optimize propulsion. To catch a wave, the bodysurfer waits in nearshore waters and as a wave approaches, kicks and strokes hard with arms and feet and then rides the wave with a stretched out body. Although the sport of surfing saw a decline in the late 1800s after Captain Cook's arrival, surfing would rise again with the help of a few die-hard surfers. Duke Kahanamoku is perhaps the most remembered and respected Hawaiian surfer, a champion Olympic swimmer who epitomized Hawaiian athleticism and helped the sport reach unbelievable popularity. Duke is credited with bringing surfing to the mainland and possibly even to Australia. In 1905, Duke and his surfer buddies started a surfing club that was to influence many, called Hui Nalu (Club of Waves). Duke and his comrades were known as the "Beach Boys of Waikiki," true kings of a sport in the midst of an epic comeback. 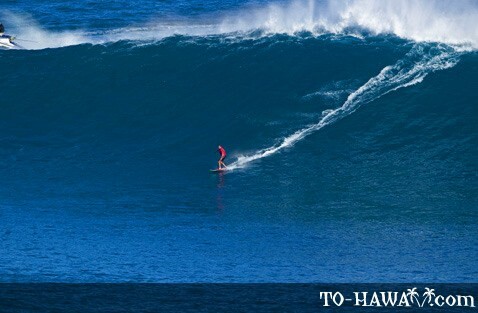 Unlike on the U.S. Mainland, wave heights in Hawaii are measured in "Hawaiian Scale." The measurement is always in feet. Also, what is measured is the back of the waves (the rideale portion of a wave, from trough to crest). The measurement is scaled so the actual wave height on the face is about twice what is quoted. This basically means that if you hear the surf reporter say, today the surf is "6-foot Hawaiian" you have to double that since Hawaiian is about half the face size. A 3-foot Hawaiian wave is about head high and a 2-foot Hawaiian wave is about chest high. A 6-8 foot wave is roughly two to three times head high. The Triple Crown of Surfing, the sport's biggest competition, kicks off annually on Oahu's North Shore, starting in November and running through January. Because surf can be unpredictable, most surf contests are held over a period of days or weeks, playing the odds in hopes that a percentage of allotted days will yield favorable contest conditions. Other popular surfing events include the Menehune Contest and the Haleiwa International Openn, the Excel Pro, the Quicksilver Eddie Aikau Big Wave Invitational, the Backdoor Shootout, the Bodyboarding Pipeline Pro, the World Championship of Women's Bodyboarding, the Monster Pipeline Pro, the Banzai Women's Pipeline Championship, the Buffalo Big Board Contest, the Pipeline Bodysurfing Classic and many more amateur events held around Oahu. The sport of surfing has it all - thrills, spills, glory and competition. Surfing as a rich cultural practice in Hawaii lives on in the souls of surfers who ride for the love of the sea and for the indescribable feeling of freedom in transit. 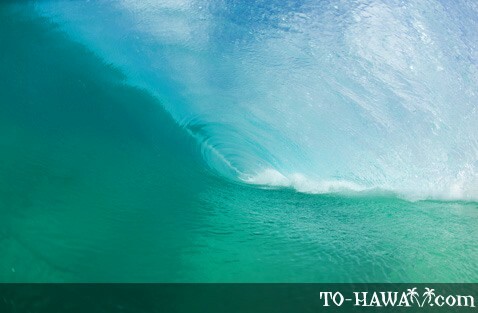 Many will argue that Hawaii is home to the best surf one could ever experience. If you're a dedicated surfer looking for an unforgettable ride, the Islands are waiting for you. For those who are not ready to brave the ocean's dynamic waves, you can look forward to taking up the entertaining and fun role of surfing spectator.